This month we're taking a walk on the seedier side of life, down dark alleys and into the evil that lurked within, with a Film Noir marathon. A cynical detective, a dead partner, a femme fatale pulling a damsel in distress, a mysterious foreigner, an adulterous widow, a secretary whose one smart cookie, a goon with a gun, and the cops at the door. All this for the black bird that's worth killing for. 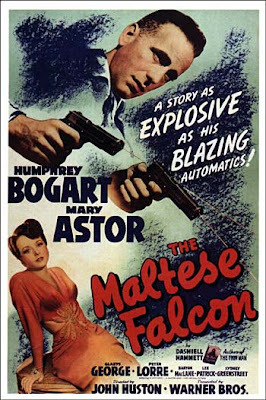 The Maltese Falcon appears on the American Film Institute's Top One Hundred Movies List as number 26, and is widely considered to the be the first ever film noir. It is also the movie in which Borgart got his break as a lead actor. Based on the novel of the same name, it tells the story of Sam Spade, who's partner ends up dead after undertaking a job from an obviously deceitful woman. 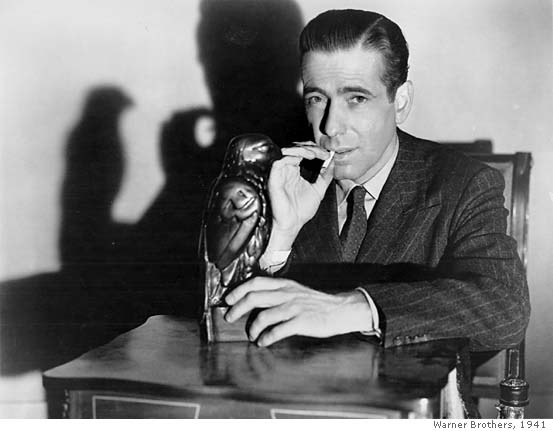 As Spade investigates further, the story takes a turn when it becomes clear that everything revolves around the recovery of a "black bird"- a statue called the Maltese Falcon. The film was technically a remake from Warner Bros. but none of the previous films had much more than the name in common with Dashiell Hammett's book. So when John Huston wanted to take a shot at directing, a college suggest he take a his shot with actually shooting the book. They got a secretary to type up the book in script format, and the project was approved. It remained, word for word, and scene for scene almost exactly as Hammett wrote, with the exception of that memorable ending line, which was suggested by Borgart. As for the film itself?To be honest, I wasn't sure I was going to like it much as it got started. The scenes were short and choppy. It was hard to tell who was who. However, all that changed in the scene between Brigid (Played by Mary Astor) and Cairo (Peter Lorre) when the first mention of Kasper Gutman( played by Broadway star, but Hollywood newcomer Sydney Greenstreet). They derisively call him "The Fat Man," a name that would later be given to one of the first atomic bombs in honor of the film. The "Fat Man" exemplifies something this movie is great at, and that's unique, slightly sinister characters. These shady people are the forerunners to the characters that would later populate all other film noir. There is so much back-stabbing and playing up of both sides- it's amazing. This scene is also the point in the story where you begin to see the mystery really pick up. By the time the climax arrived I was very engaged in the mystery, and didn't see the ultimate, surprise twist at the end at all! Overall, though everything started out slow it, it got better. I would definitely recommend watching it at least once, even if just for the historic value the movie presents. So, this movie, what is it? This such a great movie! Excellent film! I also watched Key Largo a bunch of times growing up. Double Indemnity is another favorite of the genre.